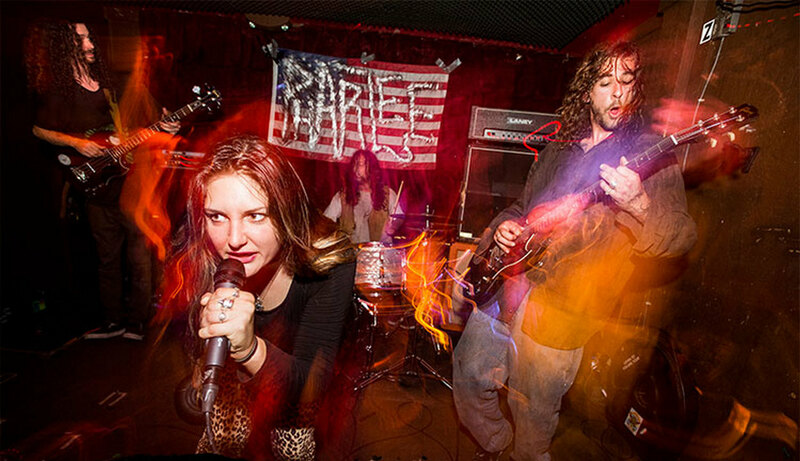 This week’s featured Meet The Band artist is the San Diego hard/blues rock group Pharlee. They just released their self-titled debut. Drummer Zach Oakley introduces us to his band. Chad Bowar: Give us a brief history of Pharlee. Zach Oakley: When I first saw Pharlee I wasn’t in the band yet. It was Macarena (Rivera) on vocals, Figgy (Justin Figueroa) on guitar, Dylan (Donovan) on bass and Joose on drums. I was a fan right away because they had a super punchy songwriting formula. They didn’t go for the extended jam sections and noodly guitar solos. They were doing 3-4 minute long, catchy riff oriented tunes. When Joose left they asked me to play drums and added Garret on keys. What will be your strongest memory of the recording of the album? We recorded with our friend Jordan Andreen at Audio Design Studios in San Diego. It was a super quick process. I think we did two days with him to track everything and then spent some time at my home studio adding some extra stuff here and there. The record has a no frills, band-in-the-room sound. I think it turned out sounding exactly how we wanted it to. How would you characterize its style/sound? What led you to cover Freddie King’s “Going Down”? We learned “Going Down” so we could have an awesome party tune for live shows. People went nuts when we pulled that one out the first time. I think it naturally became part of our set list so we recorded it. The whole record is just our first set of live tunes played from start to finish. How did you come to sign with Tee Pee Records? TP is family. All of our other bands are signed to Tee Pee. Our label rep and manager, Dave Sweetapple, has been taking care of us for years. We wouldn’t be anywhere without them. Hopefully get the opportunity to play some fun gigs around town and tour some cool places we wouldn’t normally get to visit. I try not to have expectations. We worked our butts off writing and rehearsing these tunes and you can hear it in the recordings. I gave my best effort and I’m proud of my band mates for the effort they gave so regardless of the response the record gets I’ll remember it as a fulfilling experience. What has been your most memorable Pharlee live show? We got the chance to play the Roadburn Festival in Holland last year. That was probably the most memorable thing that’s happened in my life so far. Roadburn is the best underground heavy music festival in the world and we got go play and hang out there with a bunch of other bands on Tee Pee from San Diego. It was a huge group vacation to go play music with our friends alongside some of our favorite bands in the world. We’re really lucky to have been part of that. What are your upcoming show/tour plans? We’re doing a small record release Tour in May. Check the Pharlee social media accounts for the details on that one. My brother got a drum kit when we were young and we both started hitting, trying to figure out Blink 182 songs or whatever. I got my first guitar a little later and we started jamming in our shed with our buddies in the neighborhood. I think we just played punk rock stuff until we started smoking weed and listening to Modest Mouse and stuff like that in middle school that we sorta branched out from the punk stuff for whatever else was out there. It’s not like it happened overnight, but pretty much that same exact crew of buddies has stuck together since the middle school shed days and have lived in multiple stoner party houses where we started jamming through half stacks and experimenting with acid and getting really into the Delta blues from the turn of the century to the ’50s, Garage rock from the early ’60s, the heavier classic rock late ’60s thing, and the early ’70s prog rock. Throw in all the good Northern Soul and Funkadelic records and you pretty much have the basis for all my musical interests. I don’t live in crazy drugged out band houses anymore but that was where I learned my chops and realized that music was my passion. Who were your early influences and inspirations? My earliest music memory is listening to The Beatles White Album and the Allman Brothers on family road trips when I was super young. I definitely had my angsty punk days and then stoner middle school “indie” days going to see my first few shows at the Che Cafe. But I didn’t fully feel at home until I came full circle back to the Beatles and Allmans. That’s my foundation at its core. I love the blues and writing tunes and jamming. I’d say the artists and groups most influential to me now are Bukka White, Blind Willie Johnson, John Fahey, Sandy Bull, Blue Cheer/Cream/Hendrix, Duane Allman, Caption Beyond, Peter Green and Fela Kuti. Seen any good movies/DVDs lately? Haven’t seen any movies lately but have to seen this show Letterkenny? Jesus. I’ve been listening to a lot of Zamrock and world music lately. Anything else you’d like to mention or promote? The Volcano record just came out on Tee Pee in February. That’s another band I’ve been heavily involved with the last couple years writing and recording our debut record. If you’re a fan of Zamrock bands like Witch and The Funkees go check that out. I’m really proud of that record as well.